Melt butter or warm white oil and mix with cocoa powder and sugar powder in a bowl. Whip them altogether till sauce turns smooth. Add sugar powder and butter if required. Keep aside. Cut water melon in halves. Scoop out red portion from one halve of water melon to hollow. This part is used as fruit bowl. Make small pieces out of other part of the water melon. De-seed gulab jamun, mango and date. 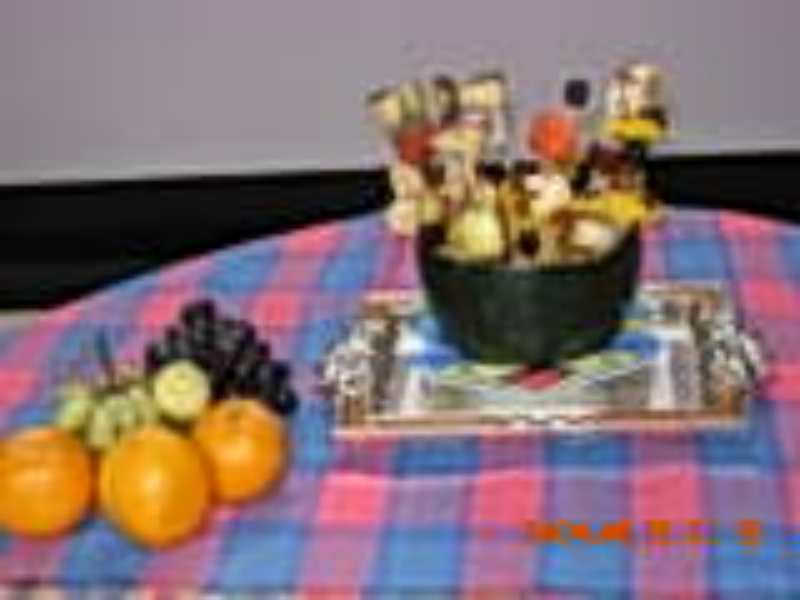 Cut all fruit in pieces and place in a bowl mix chocolate sauce and toss fruit in sauce. There should be a single piece of each kind of fruit in each stick. Put each fruit stick in a proportionate interval covering the outer surface of the water melon. Droplet of chocolate sauce should be visible in the fruit pieces. Serve chilled removing from the fridge.